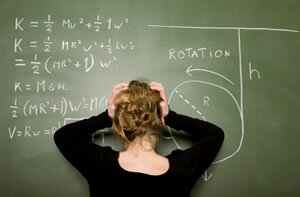 Millions of people in the United States have struggled with math. 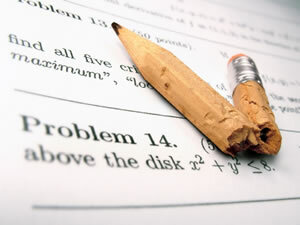 If you are one of them, or know someone who has had bad experiences with math, you're not alone. What do hierarchies have to do with math success? PLENTY! Math is on top of our academic hierarchy. We give more value to whatever is placed on top of a hierarchy. "I've always been good at math and am majoring in physics. I was accepted into college more easily than my friends who were good in writing, music, or art, but whose math test scores were comparable to my English scores, which were in the fortieth percentile. People often assume I'm smart because I'm majoring in a math-based field." "At my high school, the music and art programs were cut during the budget crunch. Math and science programs were safe from the ax." "My son's high-school counselor told us we should expect our son to spend twice the time on math homework as on any other subject. I watch him spend hours on repetitious problems involving tedious, detailed topics. In contrast, his classes on poetry and literature assign only a few homework examples to illustrate the essence of the subject." Blaming and trying to fix the bottom keeps problems intact. "For most of my life, I've felt ashamed about not being 'good at math.' My sister was good at math, but got low grades in Spanish. My sister didn't experience the guilt and shame about her failures in language that I did from my failures in math." "The teachers I sometimes talk to about my math anxiety tell me only what I need to do to fix myself. They don't see themselves or the math-teaching system as part of the problem or part of the solution. I feel like they're saying to me that if students would just experience and learn math their way, the problem would go away." People on the top operate with limited perspective and limited information. "My math is being taught in a linear fashion. The focus is on course content, and we pass through the material progressively from one step to another, similar to walking down a path of stepping stones between two end points. We memorize dry rule after rule after rule. This strategy works for some, but I am left behind at various points because I do not process information in a linear manner. 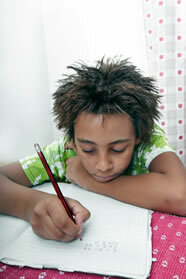 In other classes there are other ways to learn and they work better for me." "I have seen that many students who don't 'get it' are looking for something that's usually not there in math education. They are searching for a personal, practical connection with the material that will allow them to feel comfortable and confident about the content. They're asking why or wondering what it all means, trying to see how all the pieces fit together, searching for the bigger picture that's available in other subjects. "I advise these students that many of their classmates are not even thinking to ask these creative, big-picture questions. The other students are just memorizing the rules, taking puzzle pieces individually and lining them up in a row. They've been trained to turn off such questions and simply follow the rules in order to be successful in their math classes." 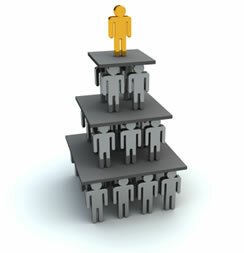 In order for a hierarchy to survive, there must be higher and lower groups. "In order to have a higher elite group - those whose math scores show they're the 'smarter' part of our society - we must have a lower group to complete the hierarchy. 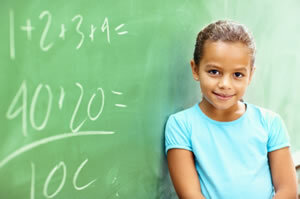 The assumption that millions of students will not succeed in math keeps us from solving the problem." "We expect all students to learn to read and write (except if they have a diagnosed disability that prevents it), so why isn't math held to that same standard?" The system ensures that those on top will succeed. "I've watched people who seem to float through math, science, and engineering, and many act like people who rise up the ranks at my job. These students appear to fall into the routine effortlessly. They've been groomed to fit in, and know how to follow the rules and jump through the hoops as directed without questioning. They feel comfortable and motivated in the classroom, because that system has worked for them in other parts of their lives. It's not that they're more capable, but that they're skilled at playing the roles of hierarchies." "There are groups who've been underrepresented in math and math-based fields such as engineering for many years — African Americans, American Indians, Latinos/Latinas, and females, Many students from these groups report that to be successful, they must reject their own perspectives, learning and communication styles, and life views. They say they mold themselves into the expected roles and rules in order to complete school. "Even though many individuals are successful, if, as whole, these lower groups from our race and gender hierarchies are underrepresented in fields on top of our academic hierarchy, that's what many people expect. If members of lower groups drop out, it doesn't ignite significant change throughout the system, as it would if white males suddenly did not succeed in the valued fields of math and engineering." People at the top are not held accountable. "If teachers in the English department constantly had this many failures, the administration would have been down their necks years ago." "If the strategies of math teachers don't work, we throw more resources their way to do more of the same. We require more prerequisites; keep adding more and more math curriculum and resources. Every topic goes through a minutia of lifeless permutations and combinations of examples. We pile more and more material on these students that we have to teach them the same topics over and over in consecutive classes because there's too much detail and discrete sequential facts for many students to absorb the first time. When do most people ever use all this math anyway? Is this job security for math teachers or what?" A person's position in one hierarchy transfers to other hierarchies. "People in the school system have treated my daughter as less capable than others just because of her problems in one subject, math. When my daughter was twelve, one district administrator told me she would have difficulty in college. He said he could predict college success by math achievement in the seventh grade." "I asked my third-grade class how they feel about math. They told me math makes you smart, and you have to be able to do math to be smart. Three of them said that to be successful in life, you have to be able to do math. Imagine the pressure we put on our children — and the fear and shame we promote in the ones who don't learn math — by the third grade!" Now that we've concluded our investigations, we'll reverse the rules and roles to generate some solutions that remove the hierarchical barriers we found. A father asks school administrators to examine the distribution of resources among departments, including the amount of homework time allotted to each type of subject. A mother tells her children and her friends that many people have difficulty understanding math, not because they're dumb or stupid, but because they are not taught in ways that make sense to them and to many other students also. Math faculty team up with teachers in other subjects to share teaching strategies. They learn that once students have the big picture, they are able to fit in the details. The teachers use real-world examples or metaphors to discuss the patterns and priorities of math problems before writing symbols and equations. Every time students notice they are having any negative thoughts about studying math, they replace them with affirmations such as: "Math is my friend." "I can find the simple path," or "I am successful with math because I know answers are available for me to find." When students notice they are feeling any personal guilt and shame about their performance in math, they remind themselves that these feelings have nothing to do with their own self-worth or value, but existence because of a hierarchy that places math on top. Educators interview people who are from groups who traditionally have not been attracted to math and science - such as women and people of color - not to change them, but as sources of fresh perspectives that can benefit all students. Members of the math faculty tour classrooms of other departments to look for ideas for how to use cheerful colors and décor to validate and encourage questioning and creativity. After the president of a statewide math teacher association realizes that a limited perspective contributes to the problem of math failures in his state, he organizes an innovative conference. People who have not been successful with math teach math and engineering teachers a diversity of ways to present material. The conference has a catchy title: "Add life and vigor to your rules and rigor."